The lid includes an inflatable tube made of Elastollan, a thermoplastic polyurethane produced by BASF. Elastollan, a material also used for medical tubing and fire hoses, provides puncture and abrasion resistance, along with an impressively high burst-pressure rating. 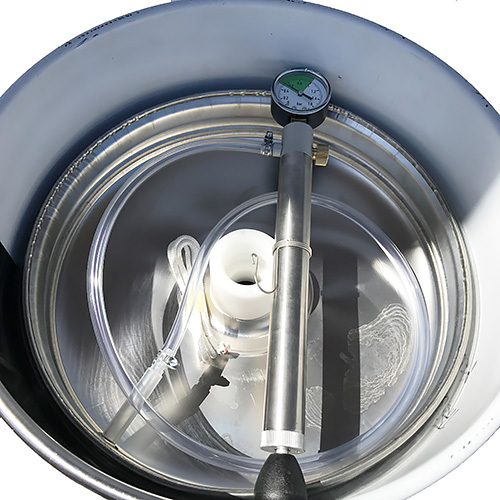 Also included is a hand pump to inflate the tube and seal the lid in place at any level in the tank. In the middle of the lid is a hole cut to allow for installation of an air lock and for topping the tank after the lid is pumped into place. We have requested that our tanks be outfitted with a TankToppr™ Airlock Riser. This is a plastic fitting with white rubber gasket that can be tightened into place and allows you to “top up” that tank to slightly above the lid, ensuring you have eliminated any head space that would otherwise oxidize your wine during storage. The TankToppr™ will require a removable #9 stopper, either latex or silicone, to complete the air seal. 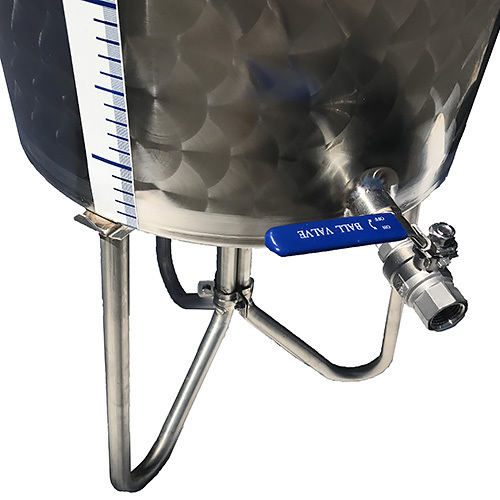 The tanks are fitted with a 1/2” NPT female port near the bottom, with a 1/2” stainless ball valve installed. The ball valve has bare female threads at the exit, so you may consider adding a PB05 hose barb, or using a PB65 Cam & Groove quick disconnect setup (1/2” MPT to male cam & groove) to complete the valve to fit your purposes. 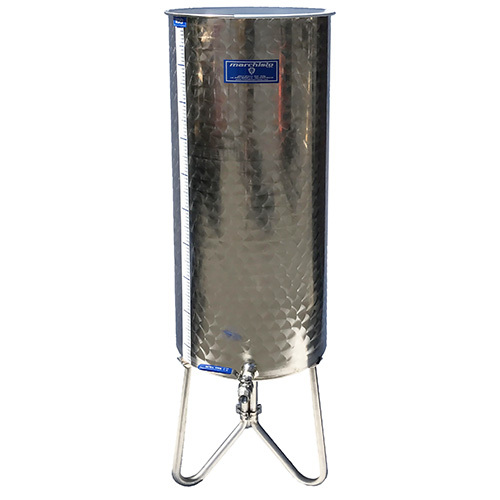 Built in Northern Italy by Fratelli Marchisio S.P.A., one of the world's leading manufacturers of both hobby and professional equipment for winemaking, olive oil processing, and other food preservation. They manufacture equipment reliably with long experience in their use, and at competitive prices. 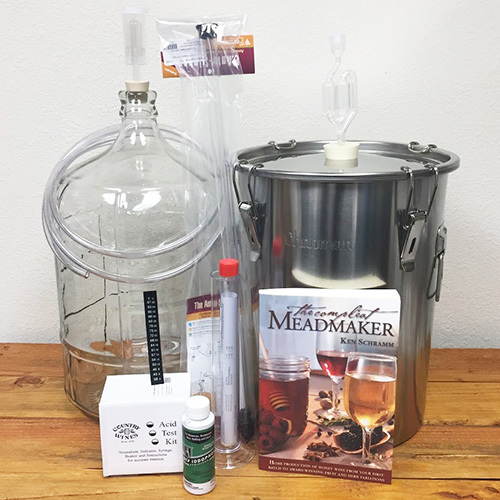 For the home hobbyist, they can be relied on for all the heavy equipment and storage tanks needed in your winery, without breaking the bank. At The Beverage People, we feel a particular kinship with this company. After all, our wine industry in Sonoma and Napa Counties is largely the byproduct of the Italian emigrants of the mid-nineteenth century and their knowledge of grapes and wine. We are happy that the winemaking connections from Italy to California continue today. The Beverage People provides a 1 year warranty. Also, we maintain stock on replacement parts such as extra tubes and pumps. Item is eligible for FLAT RATE FREIGHT options in the contiguous 48 states. Flat rate freight is available from $199 for shipments on a pallet no higher than 38" high and no more than 200 lbs to a commercial address with a forklift or dock available. Additional items may be added to the pallet at no additional cost until the limits are reached.